Yossi Milo Gallery is pleased to announce representation of artist Angela Dufresne along with M+B in Los Angeles. Dufresne’s signature compositions, at once grandiose and humble, imagined and believable, scenic and chaotic, connect widely disparate icons of figuration, landscape, movies and urban tableaux into potent mises en scène. Dufresne typically initiates her oil paintings on canvas with wildly gestural multi-color underpaintings, setting the stage for complexly composed “covers” of historical paintings. 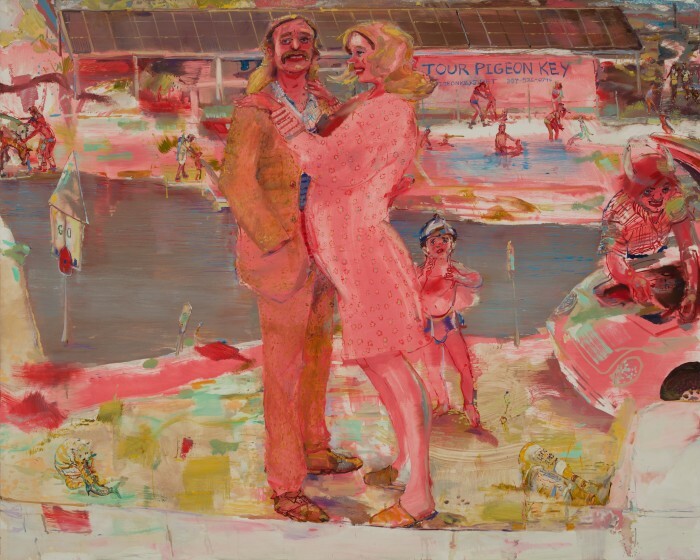 Finding kinship with artists such as Gustave Courbet, Joan Mitchell, Carrie Moyer, Catherine Murphy, Alice Neel, John Singer Sargent and Carolee Scheemann, while moving freely between pop cultural references and her own biography, the artist lays open classical themes (genre, figure, landscape, still-life) to social investigations of the present. A solo exhibition of portrait paintings, Just My Type: Angela Dufresne, is currently on view at the Samuel Dorsky Museum of Art in New Paltz, NY, through July 14. Large-scale canvases were presented in Angela Dufresne: Making a Scene at the Kemper Museum of Contemporary Art, Kansas City, MO, from September 20, 2018 - January 6, 2019. The artist's work was previously on display in exhibitions at the Hammer Museum, Los Angeles; MoMA PS1, New York; Portland Museum of Art, Portland; RISD Museum, Providence; National Academy of Arts and Letters, New York; Leslie-Lohman Museum, New York; Brooklyn Academy of Music, Brooklyn; Cleveland Institute of Art, Cleveland; Aldrich Contemporary Art Museum, Ridgefield; and Rose Art Museum, Waltham, MA, among others. Dufresne (American, b. 1969) grew up in Olathe, Kansas. She currently lives and works in Brooklyn, NY.